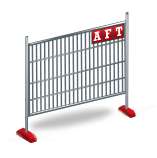 AFT HIRE has grown from a small family business to become one of Victoria’s largest privately owned temporary fencing and toilet hire organisations. crowd control barriers, shade cloth, silt protection and electricity poles. Temporary fencing is our specialty. We work closely with some of Australia's largest builders to deliver temporary fencing to sites across Victoria . At AFT HIRE we have a large, growing fleet of portable chemical toilet’s that will meet all your OH&S requirements. We are trusted by some of Melbourne's largest builders. Our friendly staff are always available to answer any questions and queries you might have regarding your next project be it short or long term hire from domestic buildings, commercial sites, civil construction, demolitions, council works, concerts and public events.